You are going to release a new single, a new album or a music video? That’s great news for your fans and I am sure some of them will see that on your social media pages. Most likely you’ll use Facebook to tell your fans about your new release. Rightly so, Facebook is a very powerful tool to reach influencers and your audience as it offers a lot of different types of content (status messages, images, videos, external shared content, etc.). For most users Facebook’s targeting possibilities are a mystery though. In the following I’ll show you how you can reach the right influencers for the cost of a coffee a day. Here’s the problem: You will only reach 20% of your fans at maximum organically. As Facebook’s news feed algorithm will not show it in everyone’s news feed, you might think about paying for more reach. There’s nothing bad about paying for more reach. 10 years ago we were in a copy shop printing flyers, paying for those too. I guess most of you were boosting content before to reach all your band’s followers on Facebook. That’s quite easy. Just select your page’s followers in the targeting options for your “advert”. Some of you might also have tried interest based targeting to reach more people who probably like the music you make. But have you ever thought about getting the attention of streaming services, radio stations, music journals & journalists via promoted posts? 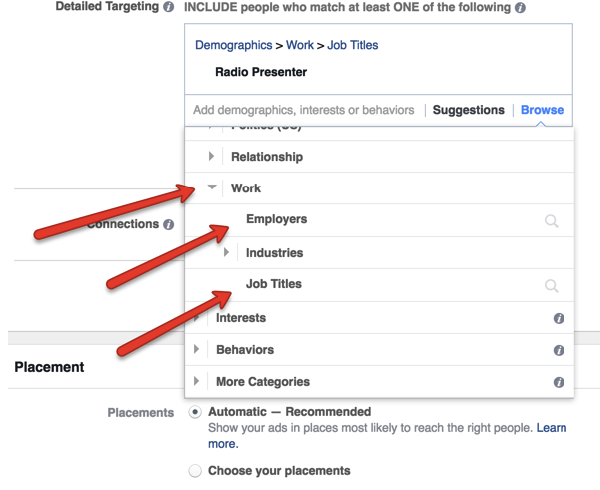 Facebook’s audience targeting comes in handy because it let’s you also target job titles and workplaces. Let’s say you want to show your new release to journalists of your music’s genre specific media journals. They will see your band’s post on their newsfeed and might listen to you. Sounds great, right? You can do the same with streaming services, radio stations, TV-broadcasters or label-managers. Okay, let’s talk about the money you will spend for your posts to reach your workplace-targeted audience. In general you’ll reach 100 – 180 people for 1€. So if you have a well defined audience of workplaces and job titles, it will probably contain about 200 persons. For the cost of 1 coffee you can reach about 100 of the most influential people in your music’s scene per day. Just by setting up a micro audience based on workplaces and job titles. 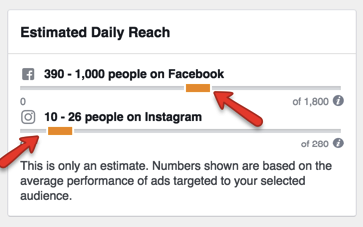 Select the daily budget, based on this targeted audience, based on the metric of estimated daily reach Facebook provides you. Keep your paid posts subliminal. If you show your post too often in your audience’s newsfeed, your micro audience will probably realize that they’re targeted. There’s some psychology in there. Facebook offers a reporting metric for this particular case. I’d recommend to keep an eye on the frequency of your ad. You can see this metric in your ads reporting. This is a metric to keep an eye on for every post you pay for more reach. The frequency displays the average number of how often your post has been shown to this audience. A daily frequency higher than 1.5 is not useful and wasted money. And that’s how it’s done: For the cost of 1 coffee you can reach the most influential people once a day directly in their newsfeed. We are about to launch an analytics platform that will show you the true potential of your music. Be among the first to get your hands on the ForTunes app: Head to ForTunes.io and leave your e-mail address or follow us on Facebook and Twitter.